Kansas-based communications services company Sprint is going to use its 5G-powered Curiosity IoT (Internet of Things) platform to create a smart city in South Carolina and develop precision ‘real world’ mapping technologies for automated vehicles with Mapbox. The city of Greenville will work with Sprint to build out smart city infrastructure and ecosystems using the power of 5G cellular communications and the Curiosity IoT platform. The project entails the installation of innovative Massive Multiple-Input Multiple-Output (Massive MIMO) technology, a dedicated IoT network technology, and other new systems across the city. 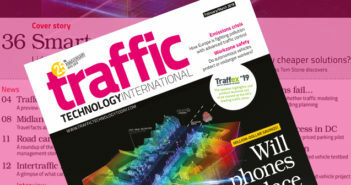 Concepts will become a reality with 5G network and ‘micro-positioning’ technology, enabling connected vehicles, autonomous drones and any other smart machines to operate, navigate and react in real time, in a dedicated area of the city. Leading companies including Smart Greenville, W8less, and LG, among others, are working together on the project, with the new technologies deployed in the city expected to attract digital startups and research and development in autonomous vehicles, AI (artificial intelligence) and robotics. The fourth-largest mobile network operator in the USA, Sprint is aiming to use its 5G and Curiosity technologies to create a new standard in IoT, which will feature device data intelligence, over-the-air device management, and chip-to-cloud security. 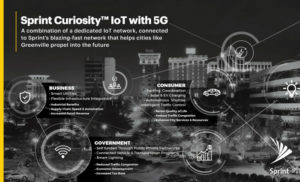 When coupled with Sprint’s ultra-fast, high-capacity mobile 5G service, Curiosity IoT’s dedicated, distributed and virtualized IoT core network will be capable of supporting artificial intelligence, robotics, edge computing, autonomous vehicles, intelligent transportation management, and other IoT systems requiring extreme low-latency and high-bandwidth. Under a new partnership, Mapbox is launching precision mapping technology with the Curiosity IoT platform, allowing automated services that run on Sprint’s dedicated IoT network to move around with pinpoint accuracy. Smart machines, from drones to autonomous delivery carts, will be able to make fast location and routing decisions using highly detailed, accurate maps that are updated as the environment changes. 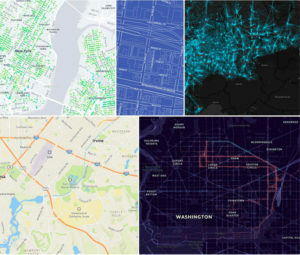 Mapbox has pioneered the ‘Live Map’ that is built from data collected from hundreds of millions of location-enabled sensors that feedback information about the world in real time. 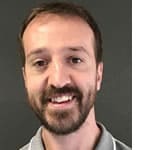 The company then uses AI to turn those massive data flows into a picture of real-time transit paths that can be used for precise, up-to-date routing. Through its relationship with Sprint, Mapbox will use the inherent advantages of Curiosity IoT with 5G to take mapping to the next level. The network’s extreme bandwidth and low latency will allow Mapbox to collect higher volumes of richer data from sensors, including high-resolution video, which can be processed to identify and detect changes in the physical environment that are then incorporated into updated maps for distribution at scale to a wide variety of smart machines.